Cales in Campania, ca. 265 to 240 BC. Silver didrachm. Roman issue of the First Punic war period. Cales became a Roman colony and the major Roman presence in Campania in about 335 BC, and never left Roman control after that. Technically, this is a Roman Republican coin, and the city name on the coin is in Latin, struck during the first punic war. Date : 265 to 240 BC. Size : 20.2 x 21.4 mm. Weight : 7.14 grams. Reference : Sear-286. Sambon 897. Jameson 66. SNG Lloyd 52. Grade : VF, nicely toned with a nice strike and well-centred, however this coin has at one time been in jewelry which has left four flat spots and on small filed area on the edge. If you look at the reverse, you can see bright spots along the rim at 11, 1, 5 and 7 o'clock that result from these marks. Obverse : Head of Athena wearing a Corinthian helmet, right. 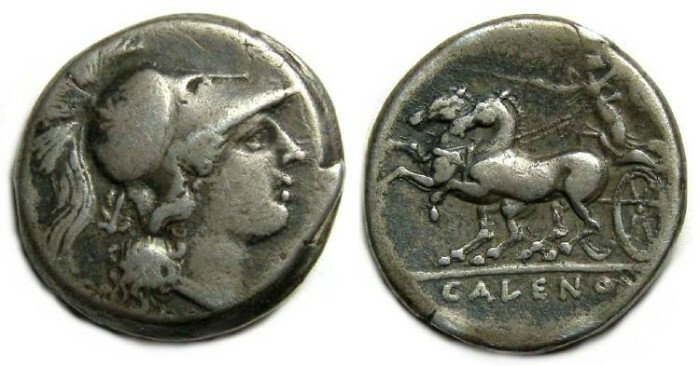 Reverse : Nike with kentron in her right hand, driving biga to left, with CALENO (in Latin) below.